Free flight Macaws & interpersonal relationships – Chris Jenkins (COO of Natural Encounters, Orlando, Florida). – . Reinforcing a hawk with Moss! 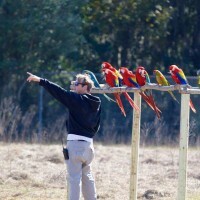 Some of the most impressive training of flocks of free flight Macaws on the planet. Positive reinforcement and interpersonal relationships. The Exotic Animal Training and Management program at Moorpark college. Chris Jenkins’ work with animals began with a summer job at Sea-world in San Diego, California. After obtaining a degree in Psychology from UC Davis, Chris volunteered at the Sacramento Zoo until he decided to pursue a career working with animals full time. In 2002, Chris was accepted into the Exotic Animal Training and Management Program at Moorpark College. Upon graduation, he worked as a wildlife educator at inner city schools in Los Angeles. Chris has worked for Natural Encounters (NEI) since 2005, and is currently the company’s Chief Operating Officer (COO). In addition to overseeing the company’s shows at a major animal theme park in Central Florida, Chris is also a training workshop instructor and spends time traveling to other animals facilities as an NEI training and show development consultant. Chris is an IATCB (International Avian Trainers Certification Board) certified professional bird trainer and member of AZA (Association of Zoos & Aquariums), ABMA (The Animal Behavior Management Alliance) and IAATE (The International Association of Avian Trainers and Educators). CLICK HERE to check out the natural encounters website. Great podcast! I really enjoyed it. I’d love if we got more into the nitty-gritty of how-tos and training in these podcasts. Where did he start with the free-flying macaws? What were their biggest insights? Setbacks? I want to learn everything! Tell me more! Thank you so much for your comments, it’s wonderful to hear from you. I’m really excited about all these ideas and I want to do everything in my power to answer all the questions. One way that has proven to be really powerful in doing this is the completely FREE and live online web-classes. The next one is actually happening in 4 days time. I hope you guys can all make it, here’s the link. I would love to hear a podcast in which you talk with Karen Pryor! Also, are you familiar with the works of Aubrey Daniels? He has written a number of books regarding the use of positive reinforcement with humans, so I think it would be very inspirational to hear a podcast of your discussions with him or one of his colleagues at Aubrey Daniels International. I can imagine that such a discussion would allow for the sharing of even more insight into applying positive reinforcement with our fellow humans! Such great suggestions … I will look into both these options … Karen Pryor would be great! Wouldn’t it! Thanks so much, you have inspired me into action. That comment about all the self-reinforcers in the environment putting more emphasis on the trainer building positive relationships! I find the challenges of free flight show training so fascinating. Greatest admiration for these trainers. I also love the comment about moving away from old school negative/punishment to positive reinforcement in our work places. It’s something that I would like to see become second nature but unfortunately we all default to because of the environment in which we grew up. I must remember to consciously make this choice myself as old habits die hard?